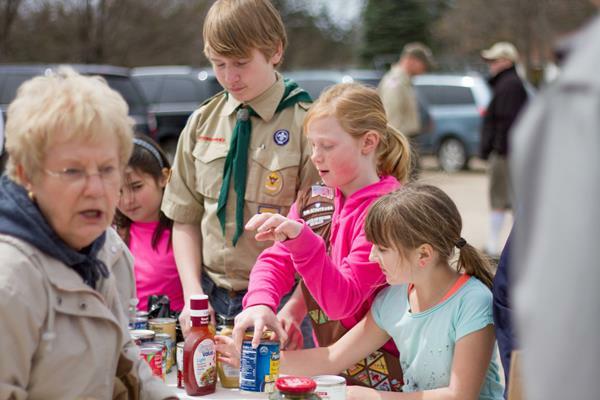 "Scouting for Food" is service project we perform for Hugo's Good Neighbors Food Shelf. 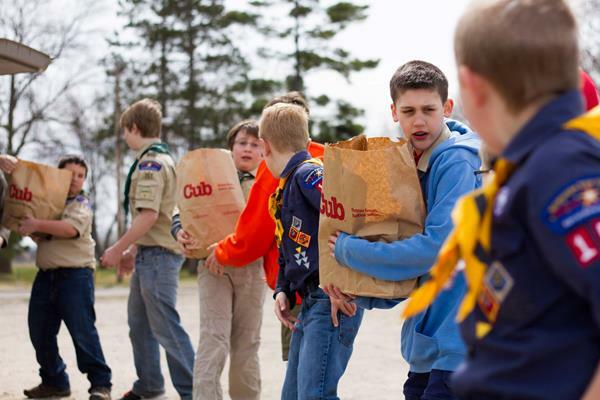 In a coordinated effort with area Boy Scouts and Girl Scouts Troops, our Cub Scouts collect donations from Hugo's neighborhoods and deliver them to the food shelf. It's a rewarding way for kids to have fun while helping others. A pizza lunch will be provided to all who participate. 12:00pm - Return to Lions Park and food shelf with donations. Teams - Here's how it's going to work. Choose your teamates by April 1. Each collection "Team" should include 6 people total: 4 Scouts and 2 adults. One of these adults will become the "Team Leader" and will RSVP for their Team. 4 Scouts (but not more) per Team is best and allows them to leapfrog while staying close together with their adult Team Leader. More than 4 Scouts per team makes it difficult for everyone to keep up and make trips to the vehicle. BSA rules require two adults per team. Team Leaders are adults who'll drive with the Team to their preselected zone, work with their Team members to collect donations, report their progress to our Neighborhoods Captain (as they finish a zone or need more help to complete their zone). At noon, all Teams will return to Lions Park to drop off their donations. Kindergarten Teams have the option of collecting food in the neighborhoods or helping at the food shelf starting at 11:30am. Kindergarten Team Leaders should RSVP which option they plan on doing. Kindergarten Teams can work with other Kindergarten Teams to cover one Zone. 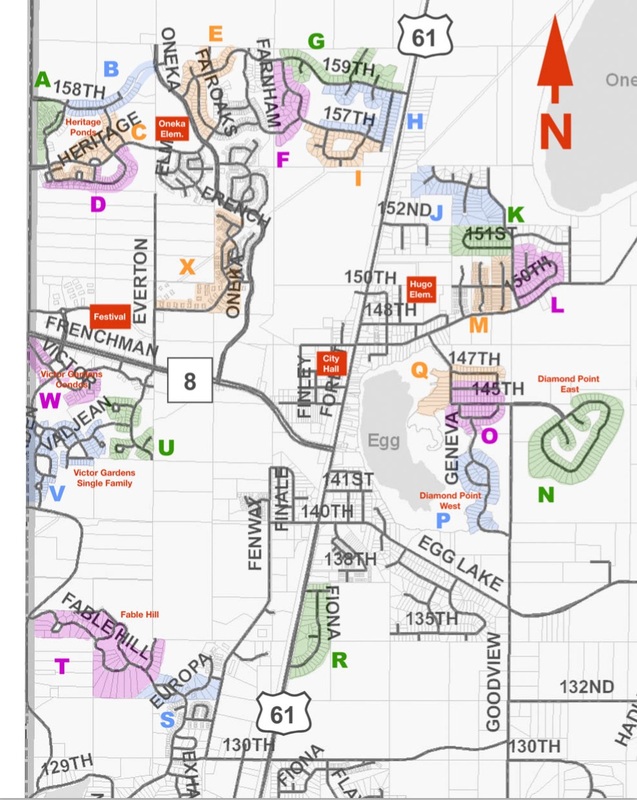 Diamond Point East (Zone N) is a good neighborhood for Kindergarteners. First off, assemble your Team by April 1. Second, as a Team decide which neigborhood zones you'll cover. We have a map that identifies all the available zones. Use the online Sign Up Genius to reserve your Team's zone. Sarah Scott is our RSVP Coordinator and she'll be keeping track of your online RSVP's. Here's a link to a printable PDF map. Print it out and bring it with you on April 11. You'll use it to refer to and communicate with the Neighborhoods Captain. Find the zone your team's will collect donations in. RSVP via our Sign Up Genius. If you have any questions about this service opportunity, please email Pack 151's Committee Chair or Cubmaster. RSVP - related questions may be answered by Sarah Scott. Team Leaders will stay in contact Neighborhoods Captain Barbara White on April 11.